Tue., Feb. 20, 2018, 3:02 p.m.
LONDON – Lionel Messi finally managed one of the few things he had yet to achieve in football. At his ninth attempt, the five-time world player of the year finally scored against Chelsea, salvaging a 1-1 draw on Tuesday and halting his longest drought against any opponent after 730 minutes. 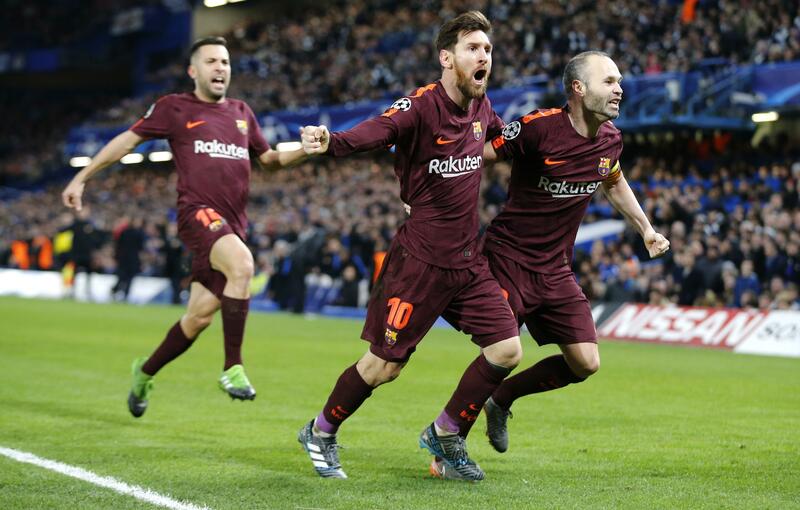 By cancelling out Willian’s opener, Messi also gave Barcelona a narrow edge in their Champions League round-of-16 matchup heading into the second leg at Camp Nou on March 14. The night’s other game produced a far more conclusive outcome with Thomas Mueller and Robert Lewandowski both scoring twice as Bayern Munich beat 10-man Besiktas 5-0. It was far tighter at Stamford Bridge, with Chelsea deploying Eden Hazard as a false nine and containing Barcelona’s energetic pressing before being made to pay for a rare slip in concentration in the 75th minute. Andreas Christensen, the 21-year-old center back who displaced 32-year-old captain Gary Cahill from the starting lineup, passed laxly across his own penalty area. Barcelona capitalized. Andres Iniesta beat Cesar Azpilicueta to the ball, skipped past the defender’s attempt to tackle and squared for the unmarked Messi to turn into the bottom of the net. It prevented Barcelona from slipping to only its second loss in all competitions since August. Twice, though, Barcelona had gifted Willian the space to hit the post in the first half. It was third time lucky in the 62nd for Willian, who drifts in and out of the team but was the outlet of Chelsea’s most dangerous moments against the five-time European champions. The Brazilian was left unmarked just outside the penalty area to receive a pass from Eden Hazard. Sergio Busquets charged forward to block Willian but ended up on flat on his back after Willian shimmied past him. They didn’t. Willian picked out a gap in the defense to send the ball into the bottom right of the night. Described by Valverde as a “clash of styles,” this was not a meeting of equals. While Barcelona enjoys a seven-point lead at the top of the Spanish league, Chelsea is in a scrap to even secure one of the Premier League’s four Champions League qualification places. Recent damaging defeats at Bournemouth and Watford have left Chelsea with only a one-point hold on fourth place – and no chance of defending its title with Manchester City 19 points ahead. Now Chelsea, which won its only European title in 2012, has to find a way to at least score at Barcelona next month to secure passage to the quarterfinals for the first time since 2014. Published: Feb. 20, 2018, 3:02 p.m.